The BMW i8 is an electric sports car that costs about $140,000 in the US. The car is rare enough on its own by some celebrities can’t just drive an already rare car and leave it stock. Take singer Austin Mahone, he bought a BMW i8 and then took it to a place called MetroWrapz for some custom work. 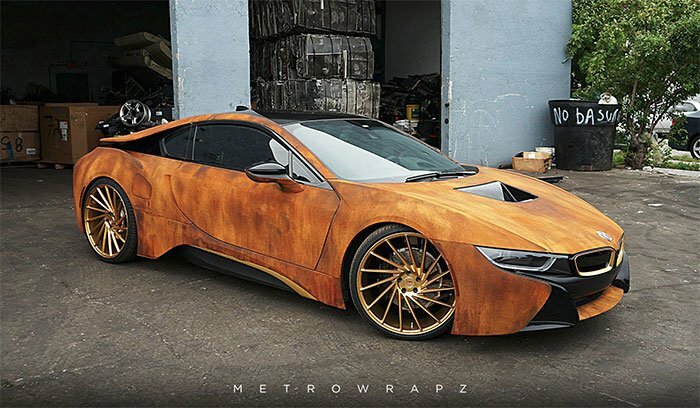 The gang at MetroWrapz took a wrap that makes the car look rusty and stretched it over the i8’s swoopy bodywork. They then bolted on some terrible gold wheels and set about showing off their creation. I guess some folks will find this thing cool, but I basically hate it. The i8 isn’t the most compelling looking car to begin with and the rusty look doesn’t help. At least the car is unique. Perhaps the best news for some is that the rusty wrap can simply be pulled off and the car is back to normal.